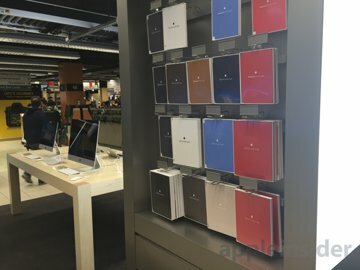 This week, B&H Photo Video's Midtown Manhattan superstore became the first of its kind to have an Apple-sanctioned store-within-a-store, showcasing the electronics maker's full lineup of Macs, iPads, Beats and accessories in Apple's familiar retail style. 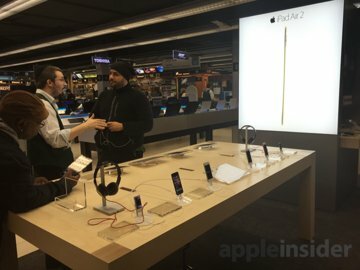 The new section of the B&H store, located at the corner of 9th Avenue and West 34th Street in Manhattan, is much like the Apple-authorized mini-stores located at various Best Buy outlets around the U.S. 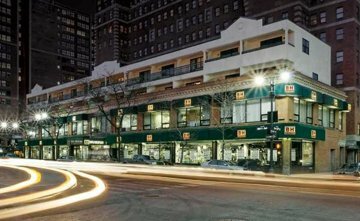 But the B&H Apple mini-store is the first in its class, as the professional multimedia seller based in New York City has just one retail location. The new Apple section of the B&H store features Apple's iconic wooden tables, with one showcasing the full Mac lineup, including the new 13-inch MacBook with Force Touch trackpad. 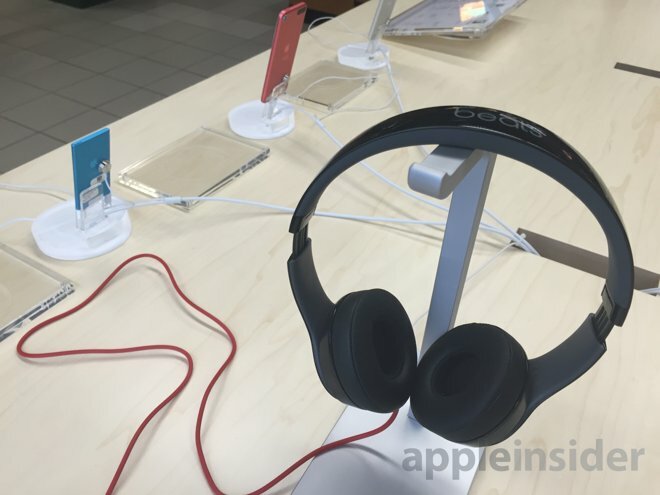 Another table showcases Apple's iPod and iPad lineups, as well as Beats headphones. 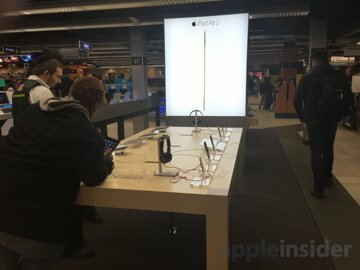 In between the two tables are large, lighted advertisements for some of Apple's latest products. On one side it showcases the new iMac with 5K Retina display, while the other features the iPad Air 2. 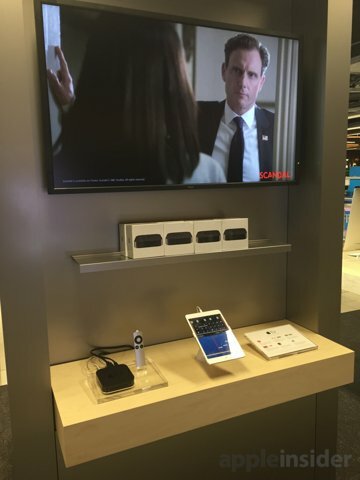 Also in this center space, B&H offers the remainder of its Apple product lineup, including iPad Smart Covers, the Apple TV, and an HDTV showcasing the capabilities of the streaming set-top box. 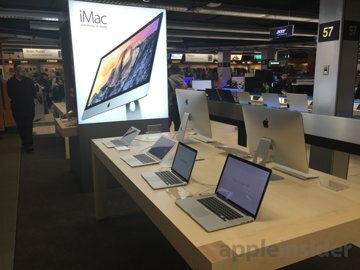 The new Apple-approved store-within-a-store only serves to spotlight the close relationship B&H has with Apple as a certified authorized reseller of the company's products. No other reseller in the country, aside from mega-retailer Best Buy, has a similar deal with the Cupertino company. It's also the first time we've heard of a single-store, independant retailer (not a chain) receiving such treatment. And the Apple mini-store also serves to help the company's products stand out from the wide array of other devices, including Windows-based PCs, sold at the B&H Manhattan superstore. 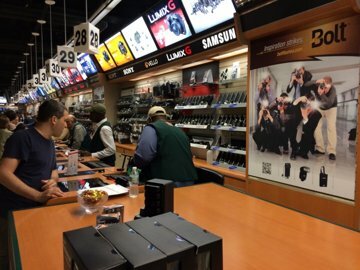 B&H has been the go-to place for professional-grade gadgetry for the last four decades, emanating from a veritable technology treasure trove in the heart of New York City. It has been open since 1973, and housed at its current spot since 1997, now joined by a major online presence. As an authorized Apple reseller, B&H carries the company's full array of Macs, iPads, and compatible accessories. B&H frequently offers some of the lowest prices on brand-new Macs with Apple's own warranty coverage, and partners with AppleInsider to offer special discounts in our official Mac Price Guide. 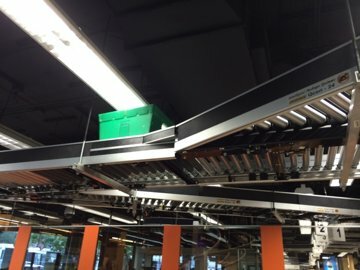 B&H's operations stand out so much that the company has entertained visits from some of Apple's top executives, who have come by to see the retailer's Manhattan location. 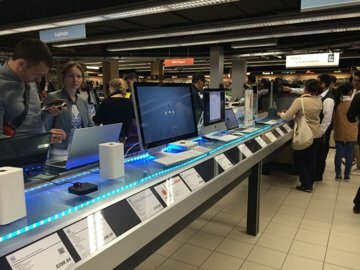 The inclusion of the new Apple store-within-a-store makes the B&H superstore a one-stop-shop for professionals who need high-end gear. 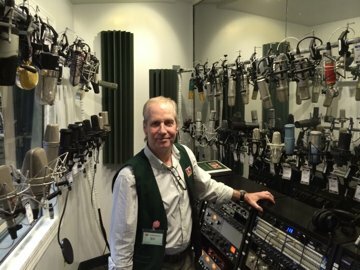 After visiting the Apple store, professionals can move on to the many other industries B&H serves, including audio and video production. 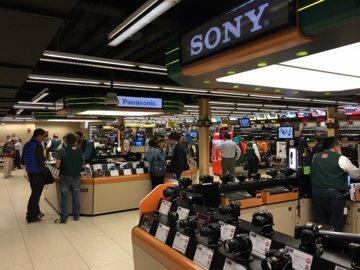 A haven for professionals, prosumers, and average consumers alike, the B&H SuperStore is jam packed with the latest gadgets and a wide variety of items you can't get anywhere else. It's like Willy Wonka's factory —quite literally, in fact, as orders zip around above you on automated conveyor belts. 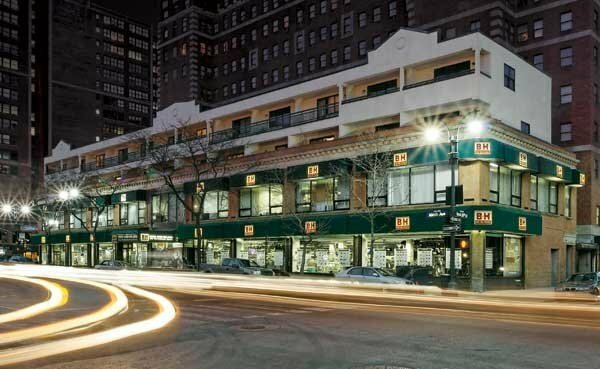 At this prime location, B&H not only has the consumer-facing mega-shop, but it also runs the company's massive operations, which extend to the website at bhphotovideo.com and include more than 1,500 employees. 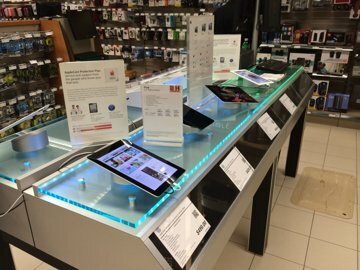 One key aspect that makes the B&H SuperStore so special is the ability to get your hands on and test out the latest gadgets. 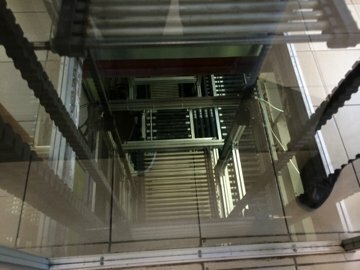 Take, for example, the sound-proof microphone room, where an array of 60 mics can be plugged in and tested live before you make your purchase. There's also a dedicated speaker room, complete with touchscreen interface, allowing users to sample the sounds of their intended purchase. There's even a full-fledged television studio on site, where professionals can try out high-end cameras and other studio-grade equipment. These kinds of opportunities give customers confidence in their investment before they buy. 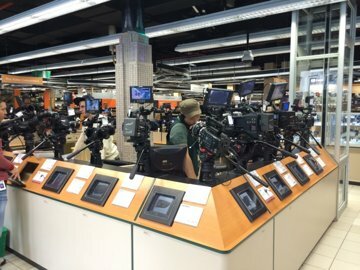 Hands-on opportunities also extend to free events, where B&H brings in camera professionals to give users tutorials on how to get the best shots. Experts on specific brands, such as Nikon, Olympus and Sony, hold workshops in an upstairs classroom, and they're free to attend. Photographers can also bring in their own camera or lens, and try out accessories and attachments with a professional. 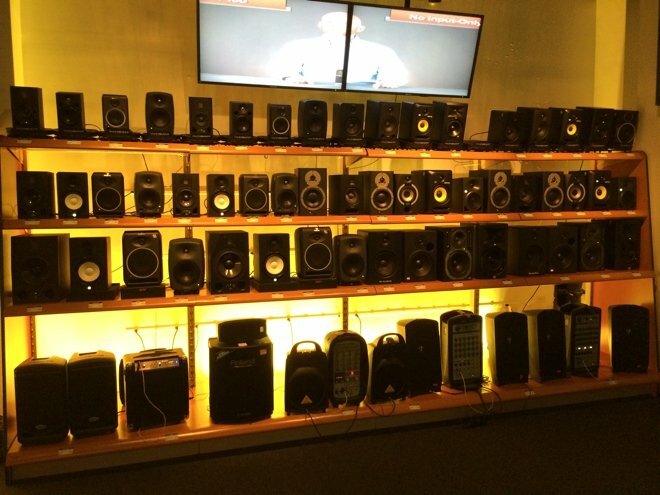 B&H officials pride themselves in giving customers the ability to become familiar with a product before they buy. These gadgets aren't locked behind glass or kept out of reach —you're encouraged to play. And whether you buy online or at the SuperStore, there's a relaxed 30-day return window, and customers aren't charged a restocking fee. Sales representatives at the store don't work on commission either, so there's no pressure to buy while you browse.